Working with an Ad firm as it’s own pleasures. You are part of photo shoots, sound recording and even film shootings. Although stressful, the excitement and experience is good. Last week we spent time shooting for a corporate training program film. And I was lucky to be selected as one of the models for the film! I reported on the sets (a shopping mall) at about 8AM. We started shooting by about 10AM and took me a good one hour to film just about 30 seconds of the script. Whew! I got some make-up done which was kind of a first for me (Actually the whole shooting thingie was a first). The next shift was only at 8PM which was very very stressful after a long day at work, anyways. We were shooting till the next morning 8AM. That was about almost 12 hours on the set. By the end of it I had spent about 24 hours on the job wide awake. On an average we did about 4 takes for each of the 30 second capsules (which the crew tells me was NOT BAD for a newcomer). By about 4AM I was too stressed out rehearsing the shots over and over again. 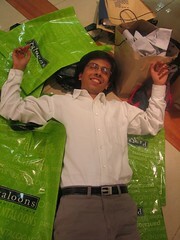 With no place to rest in sight we decided to spread some shopping bags on the floor and give rest to our body. When I got home I was left thinking with only one thought if a 16 module film took us almost 48 hours (post production yet to be done) to shoot I wonder how they managed to complete a full 3 hour movie with so many different sets, locations & costumes. I really wish I can be part of the film making team, SOON.